The chrome extension for 1p4W no longer loads from preferences. The currently one loaded in Chrome no longer works. Same here, extension suddenly stopped working earlier today on multiple pcs. Anyone having the same issue or fix ideas. Uninstalling and reinstalling extension does nothing. Thanks for writing in. 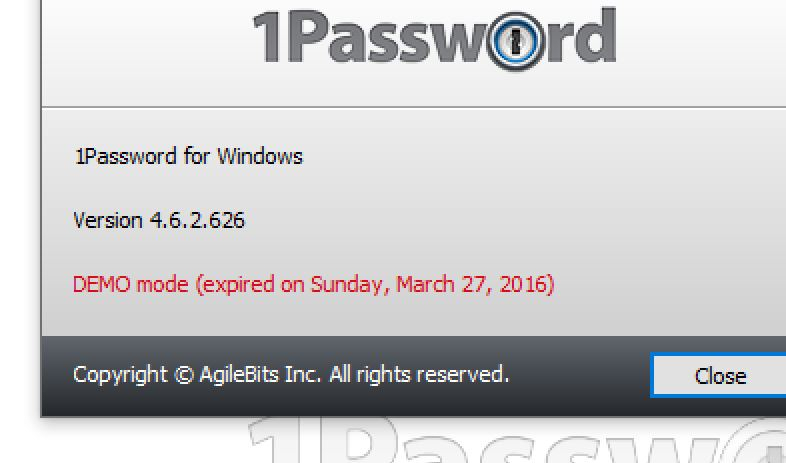 I've moved this thread to our legacy 1Password 4 for Windows forum. Google has updated the code signature in Chrome 72, which 1Password 4 for Windows doesn't support. We are not planning to update 1Password 4 to fix this; 1Password 7 for Windows has been updated a while ago to support Chrome 72 already. We strongly recommend that you upgrade to 1Password 7 if you want to keep using 1Password extension securely in Chrome. If you are not able to update or upgrade to 1Password 7, you can turn off the code signature check at your security risk via the Help Menu > Advanced, deselect Verify web browser code signatures. @MikeT how do we redownload the old extension? If I upgrade to 1password 7, does this start the subscription service as I like 1pw4 as its all paid for (multiple key purchases). Is there a way to direct upgrade to 7? how do we redownload the old extension? You can't download old extension versions, the browser will automatically update it anyway. Note that this is not related to 1Password extension; this is a security system within 1Password 4 for Windows prorgram that checks the browser's code signature. Chrome's code signature changed in the 72th update that trips our security system. Downgrading is not going to work around this, you can turn off the security check if you want as mentioned in my post above. 1Password 7 offers both 1Password.com service and standalone licenses, you can choose to buy the license for 1Password 7, it is not a free upgrade. Note you don't have to upgrade if you don't want to but if you wish to keep using Chrome, you can turn off the security check at your risk. I think 1password7 is the version that requires the use of 1password cloud and also requieres a monthly fee for using it, right? And, of course, we're here if you've got questions. Wow. Just wow. So, for years you've been denying us wifi sync with 1Pw 7, and now you're about to let 1Pw 4 support die. I'm really pissed. Consider me an ex-customer. Oh, and just to let you know: business is important for me, and if you hinder or even endanger my business, that's the reaction you'll get. Not only from me. This is not ending support for 1Password 4. As we've stated from the day 1Password 7 was released we're more than willing to continue to help y'all with 1Password 4 issues and it will still get security updates. Same as that day, the only thing that has changed is it won't be getting any further feature updates. If you're not interested in upgrading to 1Password 7 for any reason, @S5N and @res1492, you're welcome to disable the code signature check in 1Password 4 and continue using it with Chrome as Mike discussed earlier in this thread here. We do appreciate that y'all have been with us a long time. We also appreciate that 1Password 7 might not fit your needs as it stands today. We're still adding more features to 1Password 7 with every release and will continue to listen to feedback from those of you who still find it's missing something important to you. We love that you're passionate about these things and hearing from y'all helps us get 1Password 7 closer to being the app you want. I know for some, that day may never come, and that's fine. We'll be here to help you keep using 1Password 4 as long as you'd like. This is disappointing, though I expected your plan was to abandon 1P4. My Chrome extension has stopped functioning altogether. You have just confirmed that, in so many nice y'all words. And as you know, I tried but was unable to install your sketchy 1P7 build on my Surface Book, even after you intervened with support. It just would not load. 1P4 worked fine, including on my android phone, but now I am stuck. You won't support the 1P4 platform (admit it, we all get it), and your 1P7 is sketchy at best (go look up our other support exchange). Don't know your senior management, but you are feeling more and more like Apple every day. Please see attached. I've replied to your comment and tried to help in this thread but you chose to not continue our support, which we understand. However, it is not fair to say we're abandoning 1Password 4 as we're still supporting anyone that still uses 1Password 4, it just doesn't work with Chrome 72 but can be worked around. We're still here and suggesting other things like turning off the code signature check if you really really need Chrome 72 or later. As for 1Password 7 issues, as I've explained in the other thread, we've identified a few issues in recent 1Password 7.3 update and are working on fixing it. It only affects customers that tried 1Password 6 in the past and left behind an old database that caused 1Password 7.3 to crash but not 1Password 7.2, which can be used to update the database and then updated to 1Password 7.3.